Wow I am only 9 weeks into this series and yet it seems to have been going for much longer. I did not get nearly as much shop time this week as I did last. But I managed to make some time to continue to practice with the lathe and I very happily finally posted my first official Lathe Project . 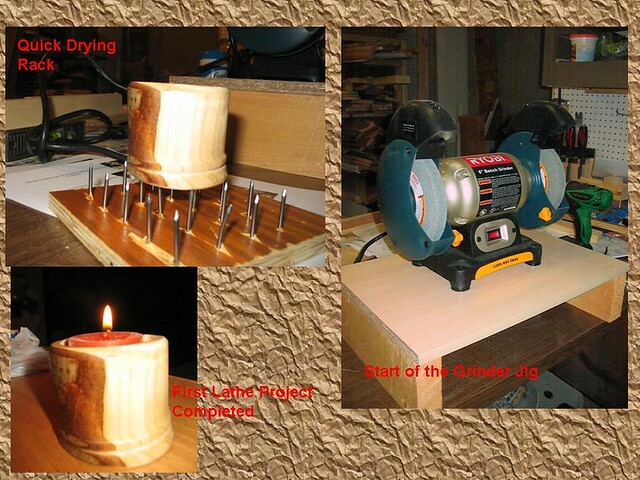 To go along with my lathe I have been searching LumberJocks and various other places on the web for ideas for a sharpening jig and a band saw log mill. I have decided on the basic design of the sharpening jig and started today to cut stuff down and things together. Here is a pic showing a very dry fit of the stand. Also pictured is my tea light candle holder I made a very quick drying board. I have been meaning to make one of these for quite a while now and seeing the 10 Cent Labyrinth video that Steve posted recently it kind of reminded me of it. I also liked the video so much that I built one of the Labyrinths. This was lot of fun to build and play with. I was happy to use my bandsaw and found that I really need a better coping saw. 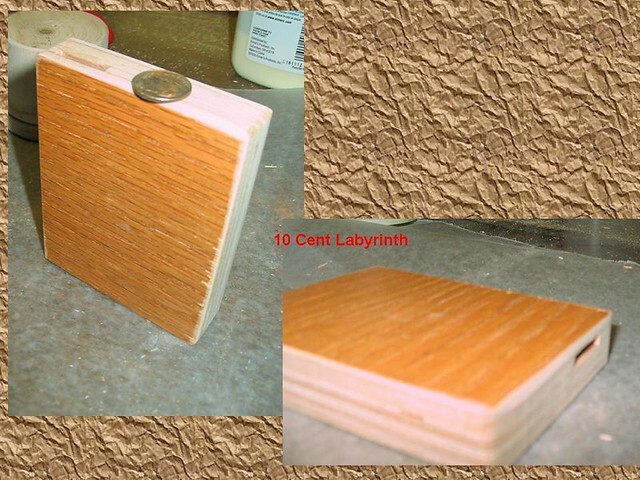 I have wood cut to be able to make one more that is a few more layers think as well. Once I get that one done I may post it as project. I did the plans for this on PowerPoint; which is generally where I do most of my planning, Quite by accident the internal maze actually cam out looking like my initials. I am making the next one a little more complicated.. I hope. As always have some fun in the shop this week.